If you've already found good ideas for names and added them to your My Names list, then you're only a few steps away from finally deciding on a unique name for your business. Check now if the corresponding domains are still available and if your name already exists as a registered trademark with the Domain Check and the Trademark Check respectively. Try out the Control Center right now! Simply register now and start finding your perfect name! Check if your name ideas contain other words and find out if the terms are associated with negative or positive emotions - at a glance! "Hidden words" also finds bad words in different languages. The App Check tells you the number of results your name idea yields in various app stores. Are there already apps with identical names on iTunes, Google Play & Co.? Is your name still available in all relevant social networks? Don't waste time searching through all networks on your own. The Social Check does this chore for you and also gives an overview of what's relevant on the web besides Facebook and Twitter. One of the main criteria for the selection of your name: Is your name idea already registered as a trademark by any third parties? The Trademark Check takes care of extensive and complicated research work, nationally and internationally. 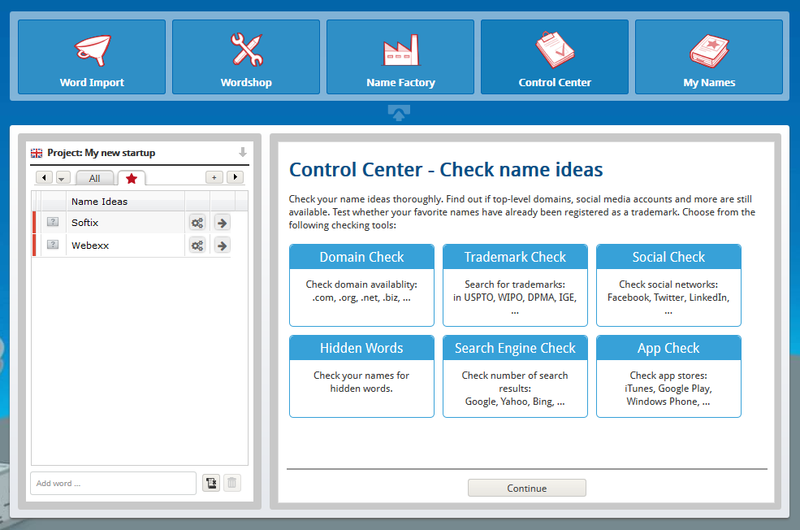 It allows you to perform a first trademark search quickly and easily by yourself. Simply select the scope and receive a helpful overview. No business without a website: See if sought-after top-level domains are still available for your name ideas. Get a quick overview of national and international domain registrations with the Domain Check. If you want to secure a domain name, you can do so with our partner.